t has been good to get out and about again after the summer holiday break. A group of us enjoyed the sunshine at Sullivan’s Bay. Carrick and Margaret arrived by boat and left chasing a ball of fish! his is an abridged version of the full delegate’s report. The full report will be emailed out with the minutes of the next monthly meeting. Anne Richardson and I missed the first part of this meeting due to our flight being delayed by 1½ hours. We can only report on proceedings from when we arrived. The Vero profit share for this financial year is $36,945.00 which is $8,000 up on last year. Matters arising from the Registrar’s Report: There have now been 11,341 VICs issued. Members are reminded that a VIC is essential for any vehicle entering a National or International event. Each VIC application must include 3 identical photographs. 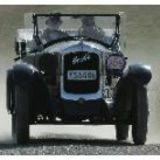 Hawkes Bay and Central Hawkes Bay branches are combining to run a first National Vintage Rally during 2020. Tentatively, this will include a run from Taihape to Napier followed by further activities in Hawkes Bay. NZTA have a new management team. WoF testing at larger VTNZ testing stations continues to become difficult due to the lack of technical knowledge relating to our vehicles that staff now have. elcome to our new members Brian Becroft and Tania Smith. They got a ride on the Are We There Yet? rally and joined us at Gibbs Farm, and we hope they will join in many more club activities. iew of two of the huge sculptures at Gibbs Farm: see more on Pages 13-15.
n Saturday 9th March 2019 we held the ‘Are We There Yet?’ Rally competing for the Mike Brown Memorial Trophy. Umbrellas at the briefing did not bode well and clearly the weather put off some folks as there were only 8 cars, mostly moderns. olling down the driveway of Dave & Barbara’s property is like arriving at Riley Heaven. Several Morris Minors and various Minis wait patiently for TLC but attention is focussed on the Rileys which look wonderful in the two-tone paintwork for which they were renowned. Smallest is the blue and white 1965 Elf which sat at the top of BL’s tree of badge engineering, being a Mini with a single carb 998cc Cooper engine, an enlarged boot and a walnut veneer dashboard. The Elf was acquired in Auckland as a half-finished project which Dave completed and it’s Barbara’s daily drive. The cream and red 1936 Kestrel is a 12/4 6-light model with the 1.5 litre motor which was so successful in racing in the 1930s. It had two cams near the top of the block giving it a cross-flow head with hemi-spherical combustion chambers and it was more powerful than most of its competitors. The car originally came from Christchurch but Dave bought it in Kerikeri. The motor was in pieces and Dave put it all back together. The green and cream 1950 RMD Drophead Coupe is a rare car: a few more than 500 were made and it has a 2.5 litre version of the 4-cylinder Big 4 twin-cam engine which produces 100 bhp. Dave brought the car in from Australia in 2016, completely stripped and in pieces. It had been sandblasted in the 1970s but had not been repainted. It was covered in surface rust all over, but the panels were in good shape. Dave has sandblasted it again and painted it. He had to hand-make new quarterlight window frames and rebuild the motor, also make door catches, pram irons (someone had ‘borrowed’ them as were not with the car) and an all-new interior except for the seats. The next big job is for Barbara to sew a new hood for it, and it is close to being on the road. 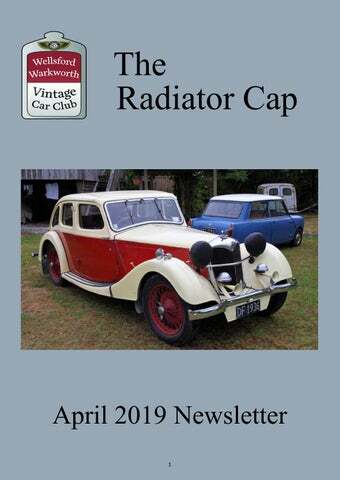 The elegant 1953 RMF 4-door saloon which Dave displayed at the recent Swapmeet was originally imported into Wellington by a doctor in 1957. In 2015 Dave retrieved it from behind a house in Auckland where it was rotting away. He replaced the roof (with a secondhand one from Australia), the floor, woodwork, repaired panels and repainted it. He replaced all the interior except for the seats and all this took about 15 months. The last of the ‘real’ Rileys before BL dumbded them down too much, it has the same gutsy 100 bhp 2.5 litre twin-cam Big 4 motor as the RMD and is a pleasure to drive. As if all this activity was not enough to keep a man busy, on the day of my visit there was a Sunbeam Talbot up on the hoist which Dave was fixing for a mate. e were fortunate to have a perfect day for our visit to Gibbs Farm on 21st March. Leon handed out tickets at our rendezvous at the intersection of West Coast road and SH1, a short distance from the entrance to the farm. Several hundred other visitors were already there and the parking marshals had it all very well organised. The scale of the place and the size of the sculptures is breath-taking, with people looking like ants next to the larger pieces. Building some of them, and then erecting them on site, must have required some innovative engineering and considerable equipment. Those who were fit enjoyed a healthy walk around the Park while Ian Cunningham kindly ferried the less fit around the circuit in the luxury of his Honda Odyssey. It was a treat to see these famous installations in their beautiful setting on the shore of the Kaipara harbour and it was an excellent day out. he extols the carâ&#x20AC;&#x2122;s virtues and explains its many unusual features. He also takes it for a drive along the freeway in Los Angeles where it is more than able to keep up with modern traffic. n Saturday 16th March, James and I had the pleasure of escorting Owen Treadwell to his 80th Birthday party in the Chandler. The reason being, Owen's grandfather purchased the Chandler new from W S Miller in Khyber Pass in 1925. Owen remembers the Chandler from his childhood so it seemed appropriate to his granddaughter to surprise him with a treat. We drove Owen around Wellsford arriving at the RSA for lunch. In the photo, Owen is with his older brother. James and I enjoyed lunch with the family and also had a good catch up with Ken Woodcock who is a foundation member of our club. THE GREAT B.M.C. CLEAN-UP GARAGE SALE 10.00am to 2.00pm Sat / Sun 4th & 5th of May at 45 Ngarahana Ave, Paremoremo.